Phoenix eyes can be slanted to a small, or large degree. 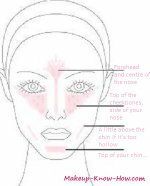 So you can use the makeup guidelines here according to what you'd like to do. It's really up to you and your mirror. Do you want to emphasize the slant, on downplay it? Do you want to make them longer, more rounded, or flatten them out into an intimidating squint? I'm going to be using the term 'phoenix' interchangeably with 'slanted' eyes. This is because the makeup here is generally suitable for any eye that has an upward angle. I think most women with these eyes may have this problem- tons of men thinking that they want them- just because they looked at them. I know that's what I'd think if I was one of those assuming simpletons. If you are blessed with natural cat eyes though, first start by determining the eyebrow shape that will do you the most justice, and then explore different ways of applying color. The best route to definition is to follow the lines of your eye shape. Use eyeshadow patterns that outline the linear form of your eye. Horizontal patterns will especially work if you have mono lids. If you choose vertical ones, then the darker color is placed on the outer part of your lids. It looks better when you also combine that with placing that dark color along the bottom part of your lid, and wing the eyeshadow a little. The effect sharpens the shape. Sometime it's nice to look a little different to the way you usually do. If you want to do so here's how. Your main focus should be the use of eyeliner. So without making any obvious patterns with your color, apply a one or two color shadow. If you'd like to play around with color, apply the darker shadow on the outside half of the lid, without winging it. You already have the shape that most people try to create with the classic three color palette, so use simpler patterns with light and medium colors. For your eyeliner, start by tight lining the upper lash line. Then apply liner all the way across, making it thicker on the outer corner of the eye. Blend it out so that it's soft. This way it doesn't make you look too hard and angular. Apply mascara, with a few more swishes on the outer lashes.